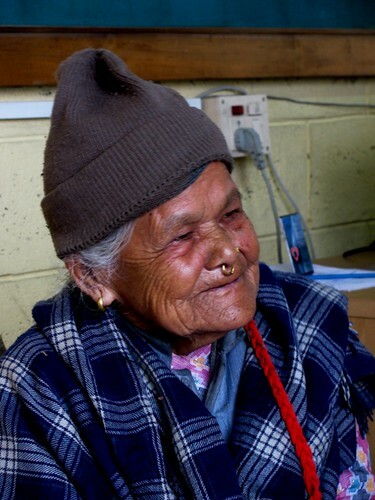 Elder Program Lady, originally uploaded by travelertrish. This is one of the women my volunteers interviewed for our book on Father Burns, the director of Hayden Hall for 40 years. Between projects, I'm here in Delhi to share the last few days of my daughter's summer in India. I'll be publishing a report and evaluation of my work in Darjeeling's Hayden Hall, probably by the end of the week. I am somewhat disappointed not to have made more headway with the Rotarians, but we did have a few successful moments and I have some evidence that they DO want to work together to do a project that could take place during my tenure as club president, starting in July 2011. I'll have a separate post on that project. In the meantime, I've also been able to keep the home fires burning, with Skype calls to my former boss to resolve one or two small problems that have come up, and my future boss to further define what our work will be and how we'll proceed to become THE go-to org for tech support in the Triad! The project for Hayden Hall is about to wind down. I finished the rough draft of Father Burns' life today, and Shikha wrote up the story of Father Hayden's life, the priest for whom Hayden Hall is named. We got photos of those who were interviewed, and one more interview to complete before everything I promised the new director, Father Kennedy, is done. This has been a fascinating project, partly because I was present in 2006 when the first replacement for the founder and longtime director showed up. He lasted a very short time, and when I arrived two years later, he'd been successfully banished. This new director seems better equipped to handle the challenge ahead of him perhaps. There is a great temptation-- and this is the journalist in me aching to come to the fore-- to analyze the situation out loud, partly to get a better grasp of it myself, and partly just because intercine political battles are inherently interesting. But I'm a professional and so suffice it to say that the booklet Father Kennedy wants to put together will have, by the end of tomorrow, all the "deliverables" (as we say in the contracting biz) delivered. I was telling my old boss that, once again it is a situation of the housewife's dilemma-- do one little project and there are five others that show up as needing to be done. One of the administrators is working on a grant for a computer lab for the after-school program. could I help her with it? Another one is interested in the web site. What could we do to get in there and add thing? I came across a new one today. Radha had the grant proposal up but behind the email she was working on. She had just started to print the email when the power went out. When it came back on, the email was pasted to the grant proposal file name and had been saved that way. How could that happen? I looked for a Word temp file that might have the original, to no avail. Just one of those adventures in computing in the third world. "The scenery is beautiful here." These are the first words that C.B. Rai ever heard Father Edgar Burns, S.J. speak. Father Burns was a theology student in Kurseong and his habit, on Thursdays when the other students enjoyed their one day a week off, was to walk the lanes from village to village with his satchel dispensing medicines. In C.B. 's ancestral village, C. B. Rai was surprised to hear this foreign priest speak Nepali to him like that. Later, at the end of the 50s and beginning of the 60s, Father Burns was a warden and counselor at St. Joseph's College. His door was open very late at night for any student who wanted to talk. He was in charge of games and dramatics as well. During his rule, says C. B. today, he produced terrific teams and put on wonderful plays, like Annie Get Your Gun. In that one, there was no one to play Annie, but Father Burns kept saying, "Annie is coming." Then one day, and American exchange student arrived, and the play had its Annie. "He introduced us to social work," says C.B. When the Tibetan refugees started arriving, Father helped set up a school for the young people and got the St. Joseph's students involved. When C.B. finished college, Father encouraged him to come back after post-grad to teach. That is also how he got Noreen Dunne to return as well. She is another former student who has been involved with Hayden Hall ever since. Father Burns was charismatic, and an excellent communicator, says C.B, He was so active in his work with the poor that he led others, including C.B., to emulate his way of working. Though his parents were Catholic, C.B. was not, until Father Burns brought him back to the fold. When, in 1969, Father Burns started what was then a drop-in center for students in town, C.B. Rai moved in with Father Burns and another priest, Father McDonald. They turned it into a night college for people who worked during the day. For the first round, 127 people enrolled and nine people ended up with BA degrees in the end. Very soon, there were other activities going on-- surveys of the people's needs, literacy classes, health classes, mother and child care. The old building was demolished and a new one rose in its place. There was a Food for Work program established, where people could earn dry rations with their labor. And even though he got married in 1971, C.B. continued to teach every day and then spend his evenings at Hayden Hall doing social work. It was an exciting time, says C.B., and Father Burns, then in his mid-40s, encouraged the young people to do more. They adopted Harsing Bastie, a former tea garden where the people had lost their livelihood when the estate closed. They were eeking out a living. The students spend two weeks of their vacations living with the people. There was also a two-week camp to help the Bangladeshi refugees and a follow-up camp over winter vacation. The students taught multi-cropping and fair trade practices. When the First Gorkhaland Agitation started in 1985, many of Hayden Hall's programs, especially those in outlying districts, had to be curtailed. C.B. Rai moved on to other social service pursuits, focused on development as opposed to charity, aiming for more participation from those being helped in decision-making, looking for sustainability. Father Burns, said C.B. Rai, had a talent for drawing people together. So much was packed into those early years of Hayden Hall, thanks to that complex and highly focused man. He was very strong on principles, but then at times, seemed to think only of the product, not the process. He sometimes gave in to convenience and at other times stood for his central belief that we should all be men and women for others. Today, says Rai, we need to be men and women for AND WITH others, so there is more inclusion of those we help. Red Panda at the Zoo, originally uploaded by travelertrish. 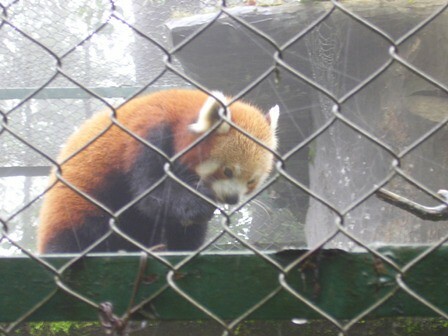 My Estonian friends went to the Zoo the other day and caught the Red Panda-- one of the most rare and famous animals in the Darjeeling zoo. They also have a snow leopard, but if the Estonians got a photo of it, it was not possible to distinguish it. I've been trying to use Skype to connect my Rotary Club back in the States with the Darjeeling Rotary Club. Last week, the call was dropped and then nobody in the US answered when I tried to call back. Well, this time we screwed up from our side with the Rotary exchange I was hoping to pull off, but maybe we've got it figured out at last. We were supposed to meet all together yesterday at the installation of officers of the Interact club at Loreto Convent School. The meeting had been postponed from the week before. It was pouring buckets of rain, just pelting down, and I was up to my shins in puddles. Besides, my umbrella has stitching holes all down the ribs, so that in that kind of rain, I was getting drip, drip, down my neck and on my head. Nobody told me the meeting was postponed. Feeling a bit uninformed lately. Is it any wonder I woke up this morning with a sore throat? My dear friend and scientist Marisa tells me that the weather has nothing to do with whether you get sick or not, but it's difficult to argue with Got soaked/Woke up with Sore Throat equation. Anyhow, the club prez arrived tonight and was willing to do the intro thing right away, but our Stateside club wasn't finished with its program, so he just basically got on with his meeting and gave me the nod when they'd finished the various reports and letters and all sorts of business. By that time, people has already left for work in America. One of the things I love about this club is that they are involved in so much. They are planning trivia quizzes in about three different locations to promote education. The members create powerpoints for the students with all sorts of information questions. This club has two Interact clubs it sponsors. They are getting ready for a visit from their District Governor, which involves putting together a booklet with all their activities. At the end of the month, they will do another health camp and the various doctors are actively recruiting other docs to participate. They have an active debate about whether to admit female members--they are an all-boys-network at the moment. They put on various events for the poor, including a party with presents on the occasion the equivalent of our Christmas. When I was here before, they had also sponsored a Room to Read library and after-school program at a village nearby. They had ties to a Sisters of Mercy project for men with mental disabilities. So they don't have "programs" for their meetings. Their hour is taken up with all the stuff they're doing with progress reports from the various members and various committees. And I don't get the impression that they hold fundraisers, either. They work with various foundations and foreigner who want to contribute and work with them. And the lights just went out, so this is going to be brief-brief... I had my first day on the Father Burns Memorial Booklet project and it was long and satisfying. I have photos of two of the three students working with me, got all the materials together and put together a task list with who is doing what up on the bulletin board. 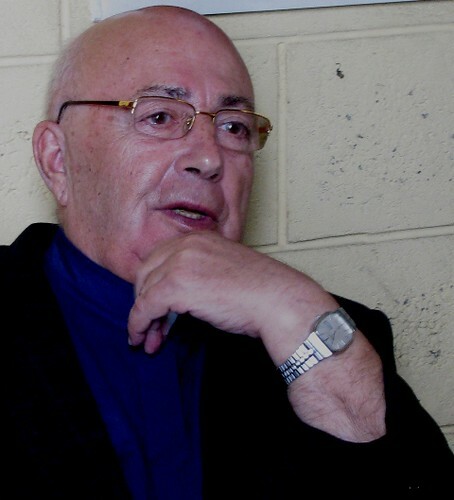 I also interviewed one of the principal friends of the late father. The real question is... will I get supper now that the lights are out? Or am I going to bed with half a box of cookies and water? I will let you know. I plan to get to the internet place an hour earlier tomorrow, so i won't be rushed. Next big interview is at 10 am. I'll leave you with the stitched photo of Kanchanjunga. The other one was only one third. This is the whole horizon.